When trying to edit a question, I noticed that I have to edit the body area firstly, and only secondly the title area. If I try to do otherwise, the body area turns blank and I can't see the words or edit anything. I use Chromium Version 65.0.3325.181 (Official Build) Built on Ubuntu, running on Ubuntu 14.04 (64-bit). The only extension I installed is Grammarly. This is a bug with the Grammarly extension. It's not a problem with the Stack Exchange editor. I've notified Grammarly about this issue some time ago, and they seem to be aware of it. 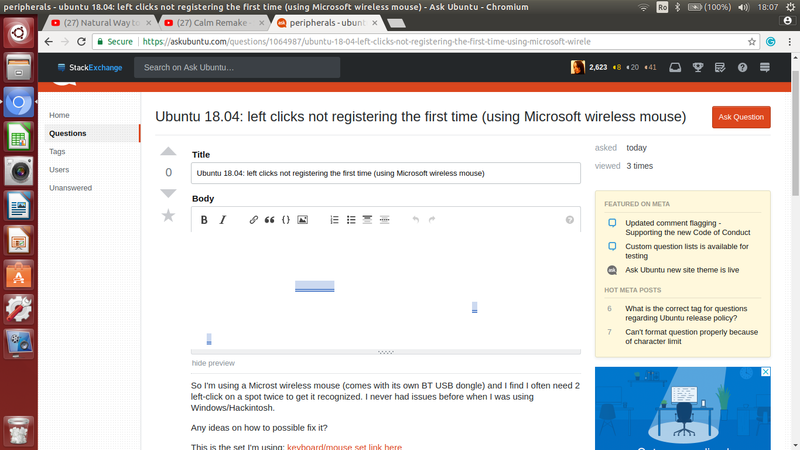 For now, as a quick fix, you can temporarily disable the extension on Ask Ubuntu when this issue occurs. Is this a bug? I can start a bounty on someone's answered question. From when it is possible to answer to a closed question?